You knew the anchovies were going to make another appearance. It came time to use up the rest of those anchovies, and at least some of my parsley, in a somewhat traditional pasta dish. I also wanted to use up tomato sauce I had made due to the bunches of cherry tomatoes I keep harvesting from my garden–in late October no less! 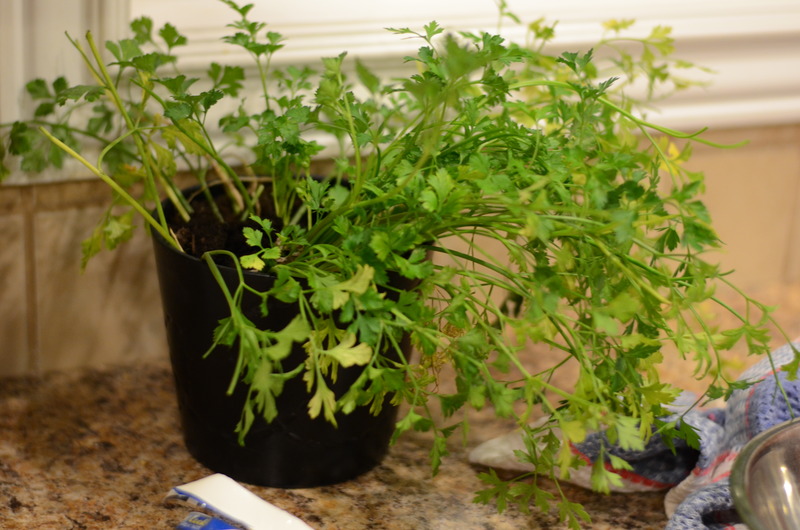 I transplanted one of my outdoor parsley plants to an indoor pot in the hopes it could produce for me in the winter. It hasn’t been looking great! It is nice when something comes together I wasn’t expecting. This salty, toothsome dish packed a flavor punch. I ended up using one of the tiny dried out chilis I had on hand, something I also grew in a planter and don’t use very much, because I thought this recipe could benefit from some extra spice. 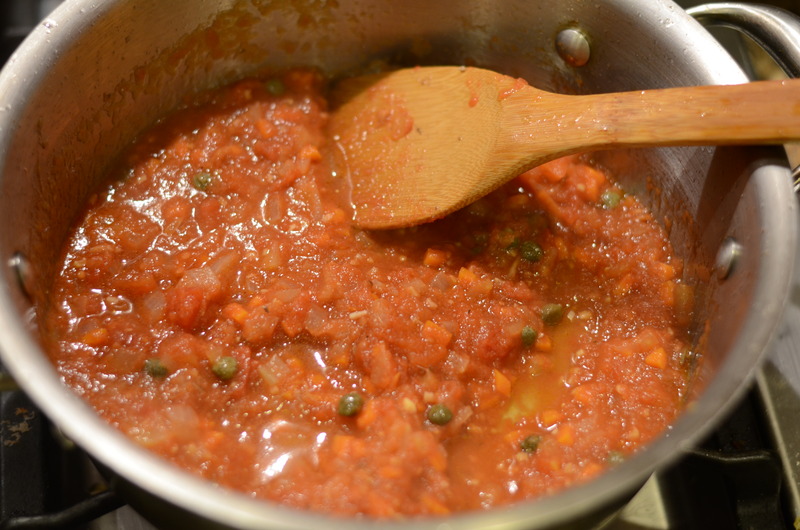 Red pepper flakes add a nice touch in tomato sauce. Since I had fewer anchovy filets available than one of the original recipes suggested, I threw in capers to fill it out. Set the oven temperature to 400°. 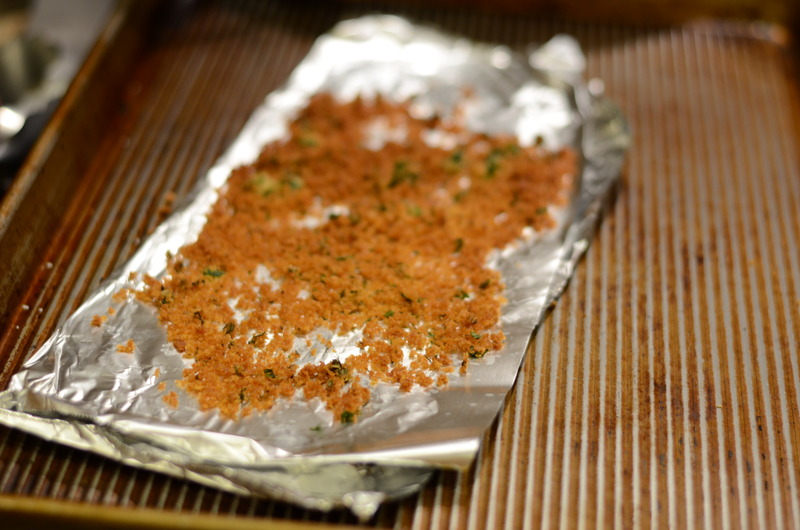 Line a small baking sheet with parchment paper or aluminum foil. 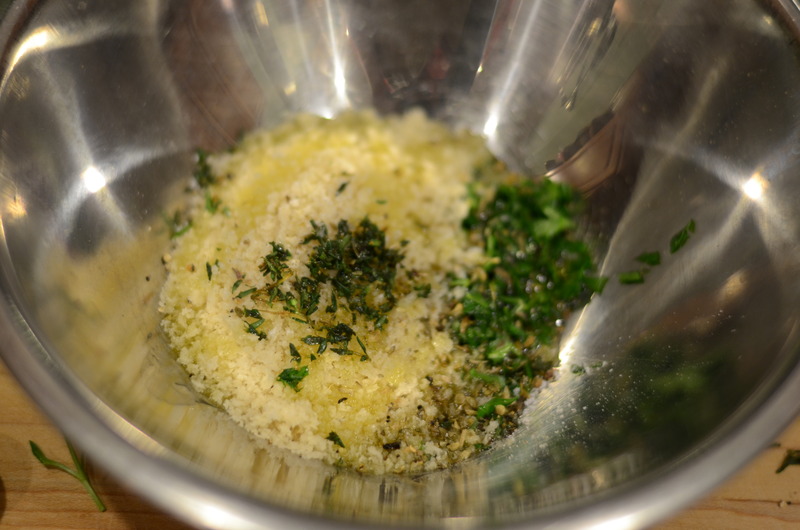 Place breadcrumbs and herbs in a small bowl; season with salt and pepper. Drizzle 1 Tbsp. oil over; stir until mixture resembles damp sand. Bake until golden brown, 3-5 minutes. Set aside. 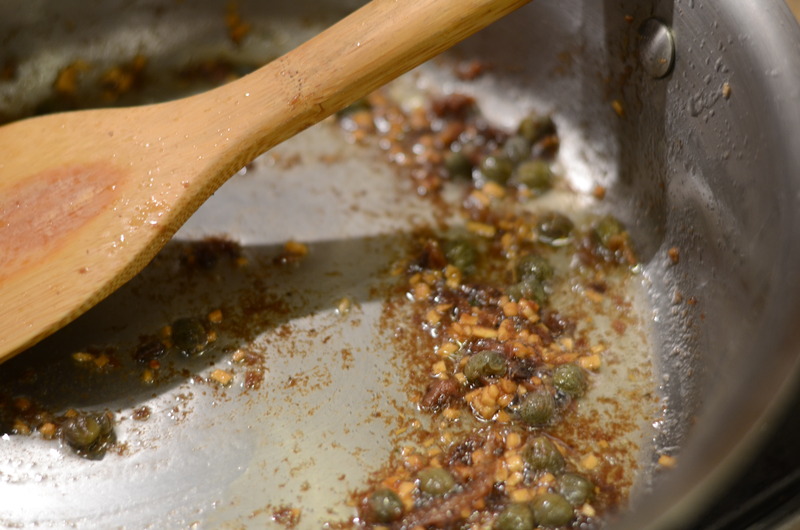 Put about 3 Tablespoons of olive oil in a medium skillet over medium heat; a minute later, add garlic. Cook garlic so it bubbles gently. 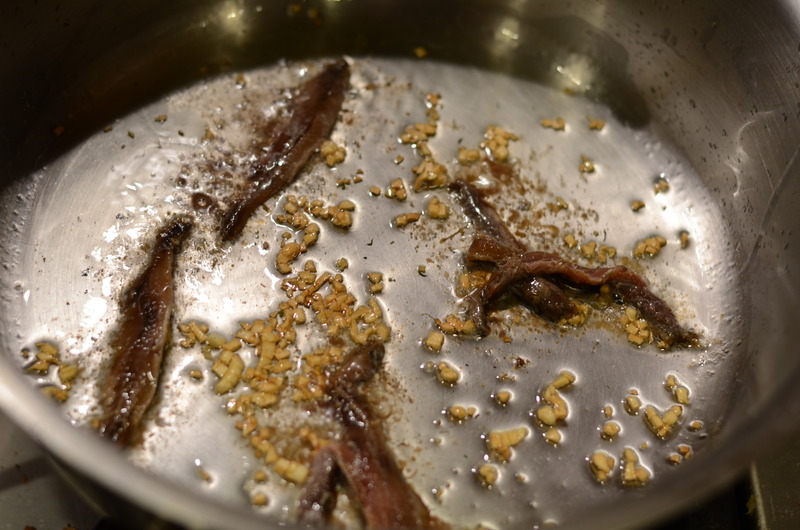 When it is lightly browned all over, add anchovies. Cook, stirring occasionally, for about a minute, until anchovies begin to fall apart. Add capers, if using. Add tomato sauce and chili. Adjust heat so the sauce bubbles nicely, and cook until mixture cooks down and comes together a little, about 5 minutes. Taste and add salt and pepper as necessary. Add drained pasta to skillet; toss to coat, adding reserved pasta water by 1/4-cupfuls if dry. Remove from heat; stir in basil. Drizzle with remaining 2 Tbsp. oil. Divide among bowls. Top each with oreganata and extra parsley. 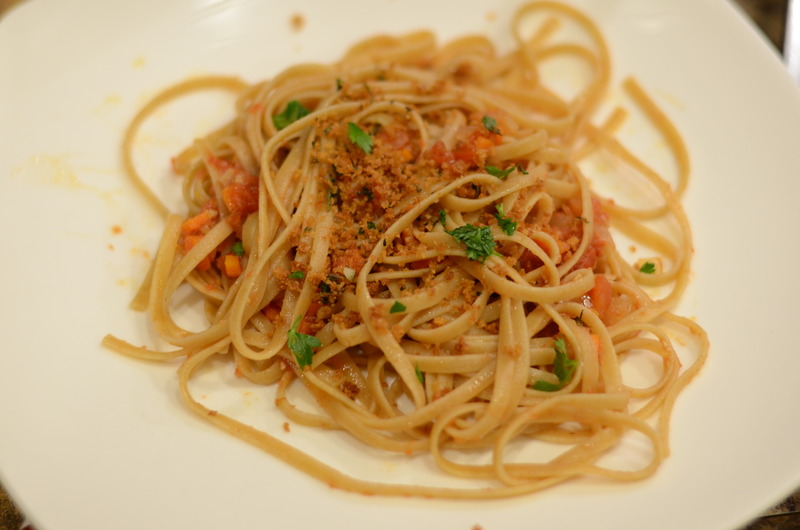 This entry was posted in Fast and easy, Fresh Herbs, Great leftovers for lunch, Pasta, Recipes, Tomatoes and tagged anchovies, bread crumbs, capers, oreganata, pasta, Smitten Kitchen, tomato sauce. Bookmark the permalink.